Innovations in the dental field in the last few decades have created a wide range of treatment options which have made it easier to preserve your natural teeth. However, at times, a tooth can become so badly decayed or damaged that extraction is inevitable in order to preserve the health of the mouth. A tooth can even fall out of its own accord. Regardless of the cause of tooth loss, it leads to many problems for the patient. Not only can they suffer from self-consciousness and embarrassment due to the gap but they may also lose some of the mouth’s functionality. Implants and dentures are the main go-to solution for missing teeth. Partial dentures are used to fill a single or several gaps while full dentures replace a full arch of missing teeth. Dental implants on the other hand can resolve many of these issues and they are a more effective treatment than dentures for the following reasons. Replacing a lost tooth means going through a procedure that will provide almost the same convenience in the mouth. Since dentures are made of a flexible plastic base with plastic or porcelain teeth attached, they are unstable and can make clicking sound when speaking and eating. On the other hand, implants are installed directly in the bone to keep them steady when you chew or talk. Also, they are made of titanium which is sturdy and safe. Since dentures never get to fit in the mouth perfectly no matter the examinations done to match the mouth structure, they have the tendency of unexpectedly slipping out of the mouth. This can make you feel self-conscious when speaking or eating. It can even affect your speech as some words are difficult to pronounce. Dental implants stay in place for a lifetime. Therefore, you can live a normal life without having to worry that your teeth may fall out unexpectedly. 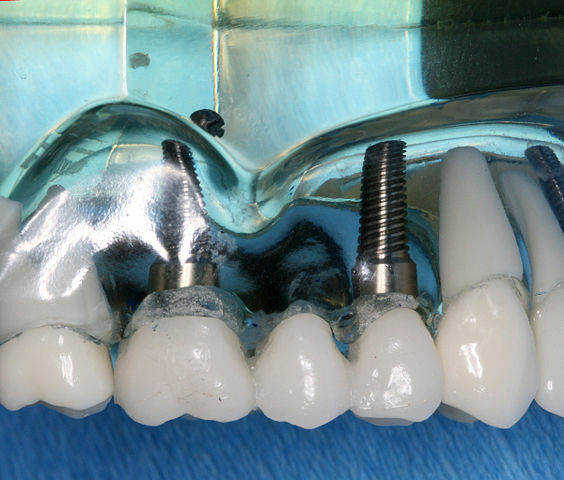 In case the bridgework requires replacement or there is a problem with a tooth in the dental bridge, then the teeth supporting the bridge may be affected. Conversely, dental implants do not rely on the neighbouring teeth meaning that the implant remains intact even in case of loss of the neighbouring teeth. With dentures, you need to change them after every five-eight years. This is because they wear out due to regular use. Also, the gum shrinks and changes in shape with age and when this happens, you will need new dentures to fit the new mouth structure. Dental implants on the other hand can last a lifetime if cared for properly. With proper oral care, you may never have to replace your implants and undergo another operation. Keeping your gums and jaw healthy is the best way to keep your dental implants in perfect condition. A major problem faced by patients wearing dentures is the loss of bone with time. Eventually, dentures become difficult to wear. The bone ridge also wears away gradually providing less support to the denture. Dental implants look like natural teeth and they actually enhance healthy bone growth as well as reinforce the jawbone. This maintains the definition of the face and keeps you looking younger.